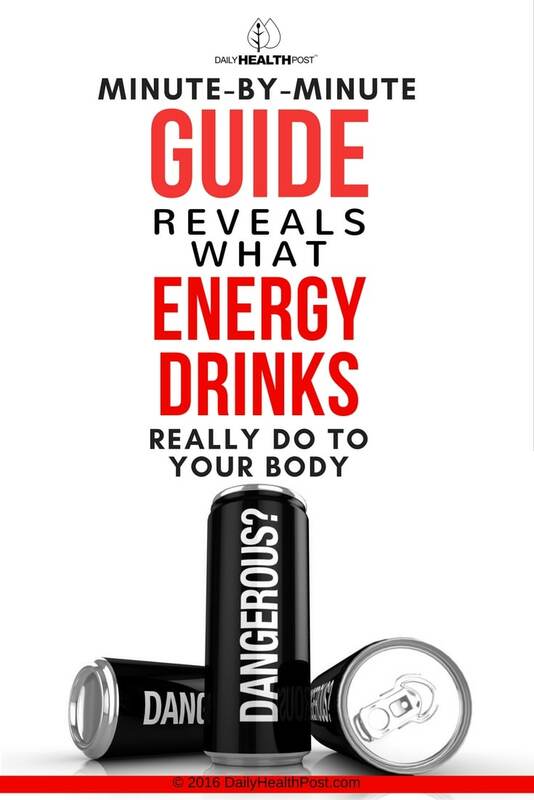 For many young people, reaching for an energy drink is like grabbing a cup of coffee. Whether it’s studying for an upcoming exam, staying awake on the road, and getting an energy boost before a party, young people are relying on energy drinks to get more out of their day. 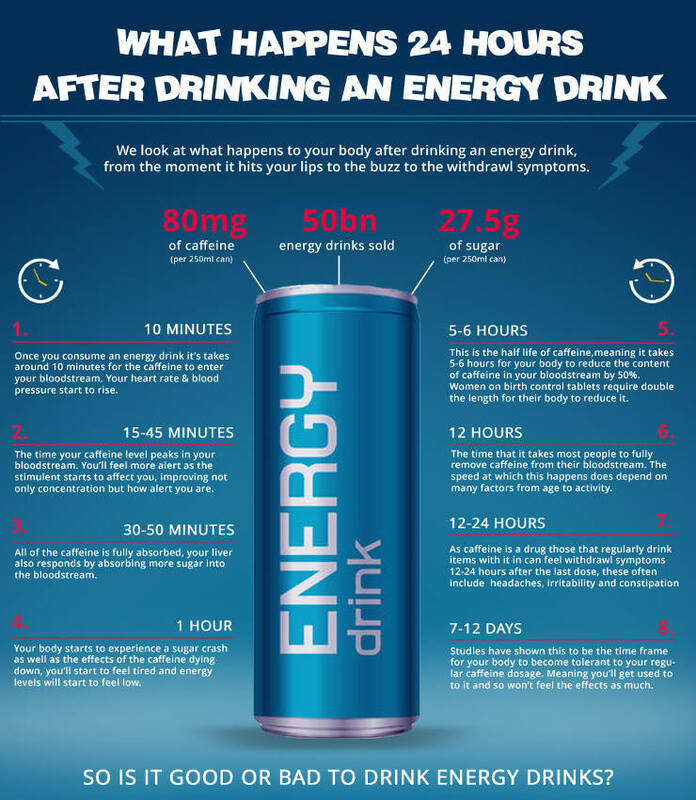 However, energy drink can be incredibly dangerous to consume, especially for young children and adolescents. In a recent article, the Daily Mail published the following chart, which breaks down how your body reacts to finishing an energy drink (1). The caffeine begins to enter your bloodstream and your heart rate and blood pressure start to rise. After gulping down an energy drink, it can take between 15-40 minutes to start to feel more alert and focused. By this point, you’ve fully absorbed the caffeine and your body begins to react: your pupils dilate, your blood pressure rises and your liver increases blood sugar levels. This causes your pancreas to release insulin, which then signals your body to store the excess sugar as fat. 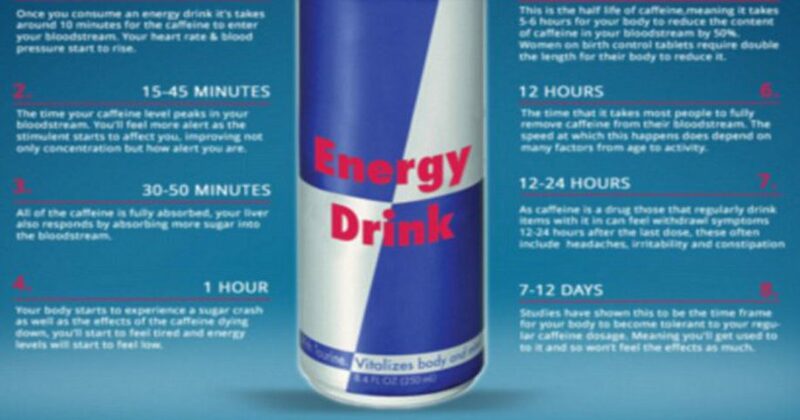 By this time, the adenosine receptors in your brain are blocked to prevent drowsiness. Researchers wrote in JAMA that, because of these effects, just a single drink increases your risk cardiovascular disease (2). Just an hour after drinking, your body already begins to slow down. Your blood sugar crashes and the caffeine slowly begins to wear down. In consequence, you’ll feel tired and possibly even dehydrated, as your body already flushed out all the water in the drink, and the few nutrients present in the drink have been flushed out with it. Half of the caffeine you’ve consumed has been used up. If you take the birth control pill, it can take 10 hours for your body to get to the same stage. By this time, most people have completely purged all the caffeine from their bloodstream. Factors like age, activity level and gender can play a role in how long it takes your body to get to this stage. withdrawal symptoms kick in. If you’re used to drinking it every day, skipping out on your habit can leave you feeling lethargic and distressed, and cause you to experience headaches and constipation. All it takes to become tolerant to caffeine is one to two weeks. This means that your body starts to need more caffeine to get the same effects.